'Spectrum' is the most beautiful sound that a designer can 'draw'. The sound drawn with Spectrum is so beautiful, but it is meaningless if it is not moving. However, Serum can add that motion through its wavetable, and this wavetable can contain large amount of those 'pictures'. Imagine, if the spectrum is in motion, we shall call the wavetable as a 'motion picture', and this is another form of an art. So, if wavetable is a motion picture and Serum is the tool to draw it, I would call this form of art an 'Artmosphere". 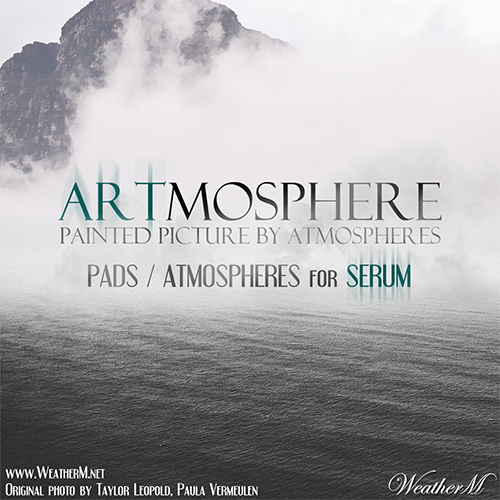 Artmosphere is an art made by atmosphere, And this beautiful art was born for Ambient and Soundscapes. 50 pads, atmosphere sounds, and other various well-programmed macro knobs will add another artistic taste to your tones and sounds. Now, get your Artmosphere and start drawing the art. -26 Atmospheric pads / 24 Ambient pads. -5 Bonus presets of outside the theme. -All sounds are perfectly assigned to modulation wheel and velocity. -Nearly all sounds are assigned to all(four) macro knobs. -32 Additional wavetables useful for ambient sound. **Requires Xfer Records Serum 1.044 or Higher.